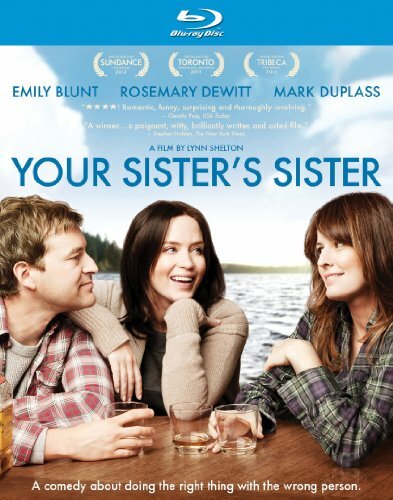 A man in mourning, his concerned female friend and her lonely sister come together for a romantic comedy-drama that has touched audiences worldwide: Your Sister's Sister , the new hit from rising writer-director Lynn Shelton. The box-office success arrives on high-definition Blu-ray and DVD on November 6, 2012, from IFC Films. A year after the death of his brother Tom, Jack (Mark Duplass, Humpday, Greenberg) is having trouble coming to terms with his loss and has hit a wall, both personally and professionally. Jack's best friend (and Tom's ex-girlfriend) Iris (Emily Blunt, Looper, The Five-Year Engagement, The Young Victoria) steps in and orders Jack to spend a week of solitude at her family's secluded lakeside cabin. No Internet, no TV, no contact. The problem is, Iris' sister Hannah (Rosemarie DeWitt, Rachel Getting Married, The Odd Life of Timothy Green, Mad Men), raw from a romantic breakup, has had the same idea of escaping to the cabin; after an awkward meeting, she and Jack inadvertently have a night of drunken confessions and shared experiences. Things get more muddled when Iris suddenly shows up the next morning, laying the groundwork for a more emotionally complicated few days than anyone had planned but perhaps they all needed. With Your Sister's Sister , writer-director Lynn Shelton (Humpday, My Effortless Brilliance) and her exceptional all-star cast - whose largely improvised dialogue helps add to the movie's raw honesty - craft a touching, funny and memorable look at the complexities of adult human relationships. An Official Selection at leading film festivals, including Tribeca, Sundance and Toronto, Your Sister's Sister received glowing reviews upon its successful theatrical release. Rolling Stone's Peter Travers said, "A trio of superb performances guide a plot that pivots on secrets and lies before they fester. [The movie] works its way into your head until you can't stop thinking about it." Said Entertainment Weekly's Lisa Schwarzbaum, "Your Sister's Sister moves far beyond easy conventions, and the rewards are all the richer." USA Today's Claudia Puig said it's "the rare film that you give yourself over to completely."